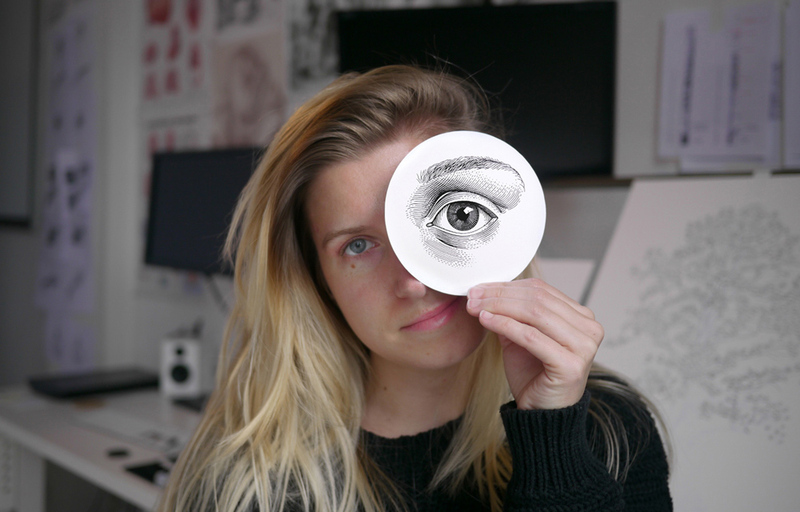 Intricate hand drawn crosshatched illustrations are what Olivia Knapp does best. Residing in Seattle, Olivia uses a combination of inked dots and line marks to create strikingly detailed illustrations. I am surprisingly good at Curling, the ice sport. Despite my total lack of experience, I’ve only been a few times; I seem to turn into the most valuable player. Strathmore Bristol Plate 500 series stocked in my flat files is a must. This is a super-smooth cotton paper coated with a thin layer of clay. I spent years experimenting with varieties of paper and this is the highest quality that facilitates the cleanest lines. The other two things I value most are features of my studio rather than the things in it. My high ceilings, for example – I am convinced that they provide space for creativity. When I don’t feel like I am in a box it’s easier for me to think outside of the box; the higher the ceilings the better. My large windows are another feature that is really important to me. The natural light provides the best visibility in which to view my work and it supports my circadian rhythm. Tell us a little about the process of your work. I like solitude when I brainstorm. I prefer to sit with my ideas for a while. Once I land on a clear vision for a drawing, I’ll start with a pencil sketch. Most of the times I’ll sketch on cheap computer paper then trace it onto a clean sheet of Strathmore Bristol Plate for the final ink drawing. I use up to three reference photos per item that I draw. I take most of my own photos. I try not to erase on the Bristol before or during inking, as it can lift the coat of clay off the cotton. When this happens, the ink bleeds, making a fuzzy line. My drawings are completely hand drawn and take anywhere between ten to 300 hours. What influenced you in the direction of your distinct crosshatching style? My love for European engravings from the 16th to 18th centuries and my background as a textile designer has had the biggest impact on my aesthetic. Before I was a full-time artist, I was working as textile designer in the fashion industry. While on a trip to New York City for a textile trade show, MoMA had an exhibit on the evolution of printmaking. I remember walking through it, viewing engravings that were blown up to an immense size. I was immersed in their imagery. Each line draped itself on the surface of its subject as if it were the tip of a finger tracing against something it cherished. When I stood back from these pieces the lines quickly became an illusion. The look and idea behind this was one of the most beautiful things I’ve experienced. Yet, this art was undervalued during its peak and rarely exists today. This moment was one of the most influential on my career as an artist. I had always loved old engravings, but this show ignited a different level of love for me. I became obsessed. I have consciously revisited this lost craft of fine cross-hatching. Unconsciously, however, my years as a textile designer have crept into my work. People often point out that my inked lines appear woven or stitched – I can’t deny the resemblance. Introspective, patient, metamorphic, methodical, and unexpected. You predominantly work in black and white – have you tried experimenting with colour and other working methods? I love colour! But I love the timeless quality of black and white even more. Color palettes are transient. They’re heavily influenced by trends and strongly impose a mood on the viewer. Black and white tends to be objective. I am really excited about experimenting with new media and applications for my work; like paint, video, found material etc. What is the most challenging aspect when creating mural artwork? Mapping the projection onto the surface of the wall before painting. I start out with an ink drawing, scan it, and then project it onto the surface of the wall to trace it. It requires a lot of precision. If you’re not careful you can easily skew the image and throw off the proportions. I am currently working on a huge mural commission for Weyerhaeuser’s new headquarter in downtown Seattle. I am creating the ink drawings now. Once they’re complete, I’ll project them onto the wall in sections then trace them with paint. The end result will be life-size trees spanning two stairwells, 40 metres tall by 3 metres wide. It’s the first time that I’ve been able to hire assistants for a project. The three of us are scheduled to start painting in mid-August 2016. It should be completed by October. This has been a year in the making, so I am very excited to see it take shape in the Fall. The conceptual artist Pae White. I think we could create some incredible installations with suspended string. You are based in Seattle – in terms of influencing your work, what would you say is the most inspiring aspect of the city. The scenic views. I live and work in a loft overlooking the Puget Sound in downtown. Sometimes I take breaks sitting in a chair sipping tea or coffee and staring out the window, letting my mind wander. Even though I’ve been in this space for years, I never take the views for granted. It inspires me when I am in a rut, relaxes me when I am stressed, and overall gives me a great sense of wellbeing. I’d be a clinical psychologist. I am fascinated by human behaviour; why people make the decisions they do. I am always trying to seek more insight into other people … I ask too many questions at dinner parties.